There was a time when resistance bands were not taken seriously, and the idea of wrestling with some rubber bands in place of a "real" workout with the iron was laughable. Those days are gone. Today's resistance bands are well-made (at least the ones I'll talk about here,) have solid, comfortable handles and conform to a variety of exercises that transfer well to sport performance. Resistance on these bands runs from extra light Versatube tubing with handles, shown at right, to the monster strength bands from Power Systems which offer resistance up to 200 lbs. with their 4 inch wide bands. 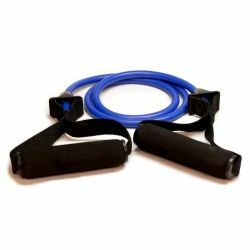 Whether you are a powerlifter, a retiree who wants to work with light resistance, or someone who simply needs a portable tool that works, a variety of resistance bands is highly recommended. Which type of tool you choose depends on what you will use it for and individual strength. The bands from Versa-Tube have comfortable handles and are available in several colors. They also come in thicknesses ranging from extra light to "Ultra" heavy for advanced athletes. This tubing is useful in combination with a Bosu Trainer or stability ball, and is also very effective as a stand alone portable gym. 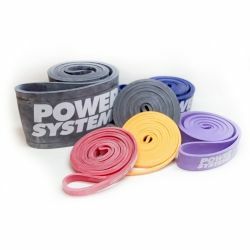 Advanced bodybuilders, powerlifters, or anyone who wants a serious challenge should definitely look into the Strength Bands from Power Systems and Iron Woody. Used with kettlebells, barbells or another method, they increase power through the movement pattern of the lift. In other words you become a better, stronger lifter. The smallest of these bands is perfect for rehabilitation or people with less muscle strength. For those who are ready, the heavy work starts with the 1 3/4" inch band delivering 65-80 lbs. to resist, the 2 1/2" is 80-100 lbs., and the "Monster" is 4" wide with a whopping 200lbs. of resistance to push and pull against. Again, for an inexpensive and effective addition to the home gym, commercial gym or to take on a trip, these are hard to beat. The price ranges from $12 to $70 dollars, and they weigh next to nothing. Visit the links below for the top quality in resistance bands, and don't hesitate to buy one and try it out. They are effective when used properly, and believe it or not, they are a lot of fun too. Which Resistance Bands Should you Choose?